The series follows the somewhat fictionalized life of Laura Ingalls, growing up as a pioneer girl as her family moves west. It starts when Laura is four, moves on up through adulthood, her marriage to Almanzo Wilder, and the first four years of their marriage. This is a charming and mixed series. The first few books were fun but also bogged down a bit for me. There was frequently too much detail on how various pioneer occupations are done and not enough of an active role for Laura. The broad strokes of life were interesting and the forays into the wild country were exciting (if slightly unfathomable why anyone would want to!) Also in these early books, they so rarely seem to have any fun! But by about book five, By the Shores of Silver Lake, Laura is getting older, the level of detail gets more reasonable, and the books pick up significantly. Book Six, The Long Winter, is a wonderful choice during a hot summer. I was listening to the audiobook last summer (it was that long ago!) and despite a heat wave it made me long for cozy firesides. 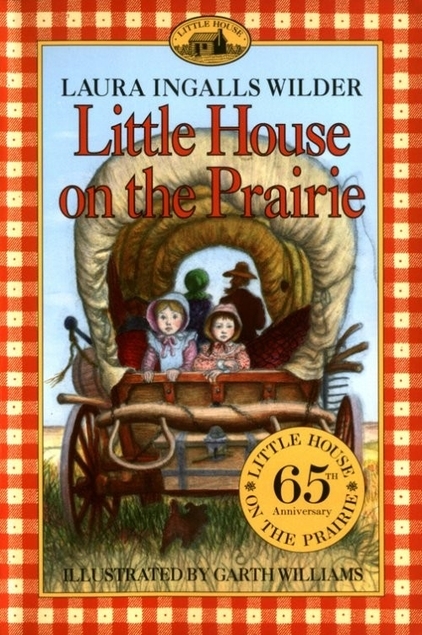 Little Town on the Prairie and These Happy Golden Years recount Laura’s teenage years, her school days, becoming a teacher, and her courting by Almanzo. These were always my favorites—the most happens, plus Laura is actually having a much better time! The last book, The First Four Years drops dramatically in quality—apparently it was an incomplete manuscript published posthumously, and it reads that way. Books 5-8 really make this series for me, but it is overall charming and (most of the time) engaging. It was interesting rereading it as an adult, as I found myself questioning the choices of Ma and Pa Ingalls far more. “All’s well that ends well” is not justification for taking your wife and small children into dangerous situations without adequate planning or precautions!! I also realized (really I’ve known for a while), that I would not have been a pioneer. I couldn’t get over the sheer isolation Ma Ingalls would have been facing in the early books—and I’m an introvert! This also points up a difference reading as an adult, looking at how Ma/Caroline would have been dealing with things even more than looking at Laura’s perspective. One thing I appreciated was how much Laura and the other characters valued simple things. A penny, an orange and a stick of peppermint were the best Christmas gifts ever. Laura and her family got such joy out of things that seem so meager by modern standards, and while I doubt I can embrace this quite as far as they do, it’s a good lesson. I listened to the entire series on audiobook, read by Cherry Jones, and she had a particularly gift for making phrases like “cool, clear water” or “soft new cloth” sound like the most wonderful of sensations. These are overall charming books with likable characters, even if I have reservations in some places. But mostly they were fun to reread, and especially to see how they look read with adult eyes! It’s interesting that you re-read these books as an adult – I’m sure few people do. As a child you would naturally not pick up on the hardships, isolation, and perhaps dangerous choices the adults made at times through the years of Laura’s childhood. I also like the fact that simple pleasures were so much more emphasized in pioneer days. We have much more materially today but are not any happier – perhaps less so, in fact. Your review raises many thought-provoking points about these classic stories.